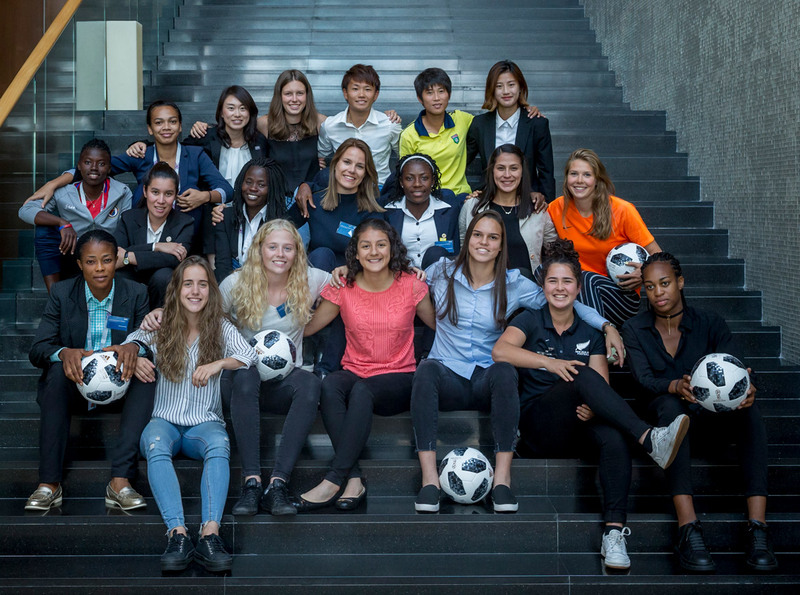 ‘Captains of Today, Leaders of Tomorrow.’ That was the fitting title of a two-day workshop held in Moscow this week for captains of the national teams qualified for the FIFA U-20 Women’s World Cup taking place in France this August. FIFA brought together the players, plus six young referees representing the confederations, to help develop their leadership skills both on the field and off it. “One of the challenges in women’s football is a lack of role models for young girls,” said FIFA Chief Women’s Football Officer Sarai Bareman. One of the guest speakers providing inspiration was FIFA Legend Karina LeBlanc, who has made a name for herself not only as a star goalkeeper for Canada’s national team but also for her exploits off the field as a UNICEF Ambassador and, more recently, at CONCACAF. “Each and every one of you brings something unique to the sport,” said LeBlanc in her pep talk to the attendees, which included the story of how Canada went from finishing last at the FIFA Women’s World Cup 2011 to winning a bronze medal at the London Olympics. Malia Steinmetz, U-20 captain for New Zealand and a member of the senior squad, agrees the women’s game is on the rise and says it has been particularly encouraging to see the women’s team gain pay parity with the men’s team this year after a historic agreement. Alexia Delgado has also seen significant improvement in her native Mexico with the launch of the Women’s Premier League in 2017. But the U-20 captain, who is bound for Arizona State University this year, believes there’s still a way to go and she is eager to contribute by learning to become a better leader. FIFA’s Senior Manager of Refereeing Kari Seitz, who is the only male or female to officiate at four World Cups, believes bringing referees and players together is valuable for everyone. Nigerian referee Alaba Abigael said she could never have dreamed of such an opportunity, particularly against the backdrop of the FIFA World Cup™. The workshop was led by Head of Women’s Football Development & Governance Emily Shaw and other members of FIFA’s women’s football division as well as guest presenter Karl Lines, National Youth Engagement & Leadership Manager for The FA. Captains of Today, Leaders of Tomorrow is part of a new-look female leadership programme that includes three pillars and is set to be rolled out in stages. The first targets youth, the second looks at developing member association staff who are in charge of women’s football and the third focuses on increasing the number of women in executive roles.